Legends never die. And I'm not sure if you know this, but this one's kind of a big deal. 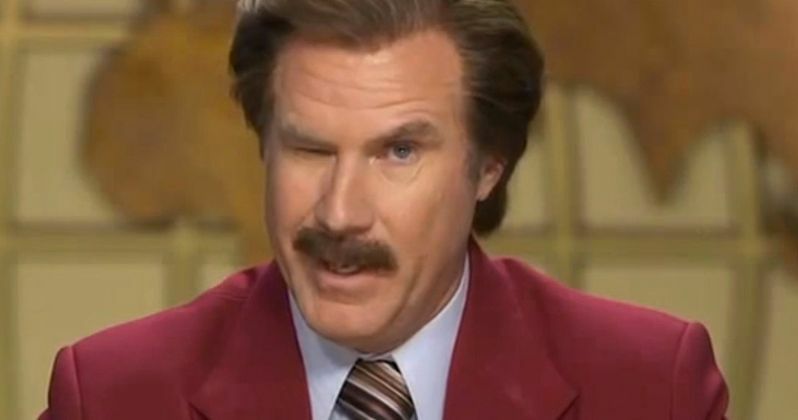 Will Ferrell is officially returning as Ron Burgundy. Not for a movie this time but instead, his company Funny or Die and iHeartRadio have teamed up to produce a brand new podcast that will feature Ferrell in character as his iconic character from Anchorman, appropriately titled The Ron Burgundy Podcast. The series will air on the iHeartPodcast Network starting in early 2019. The Ron Burgundy Podcast has already been given a two-season, 12-episode order, meaning that there are plenty of news team hijinks on the way. No guests have been announced yet, but one would hope that perhaps Champ Kind, Brian Fantana or Brick Tamland could drop by. Conal Byrne, President of the iHeartPodcast Network, had this to say in a statement, which shows just how committed they are to the bit. "To be honest, we don't want to do this podcast and we just want to get this announcement over with as soon as possible. Ron quite literally forced us into making this podcast with him, first calling us more than one hundred times in a single day and then proceeding to actually show up at our doorstep and physically force himself into our studios. We do hope the podcast is well-received, but in the meantime, we hope by agreeing to do the announcement he will stay away." This is going to be the first time that Will Ferrell has ever hosted his own podcast. More importantly, it's the first time he'll be playing the role of Ron Burgundy in any form of media (even though he's revived the character for brief one-off appearances previously) since 2013's Anchorman 2: The Legend Continues. Ferrell also released a statement and, true to his usual self, released the statement in character as Ron Burgundy. "Listen, I don't know what a podcast is, but I currently have a lot of time on my hands and a lot to talk about. I am also broke. Therefore, I am very excited to do this podcast. It is literally saving my life. By the way, if iHeartRadio says that I harassed them into making a podcast, it is a lie!! A boldface lie!! Did I call them one hundred times in one day? Yes! But that's called persistence! I have filed suit against iHeartRadio for these salacious claims. I will be representing myself legally, since I currently do not have enough money to hire an attorney." An official Twitter account was also launched for the upcoming podcast and if the first exchange from the account is any indication of what we're in for, it's going to be a treat. Ron Burgundy began a lively exchange with CNN's Don Lemon, which is pretty amazing and is best read in its entirety, which you can check out for yourself below. There is no exact premiere date just yet, but The Ron Burgundy Podcast will debut on iHeartRadio sometime next year. We'll be sure to keep you posted as any further details are made available. Have you heard of “podcasts?” They’re hotter than Jane Fonda’s workout tape! Anywho, I need help getting the word out about mine. What do you say best friend?